A Facebook recruiter is surrounded by UC Berkeley students eager to join the tech industry primarily clustered around Silicon Valley. 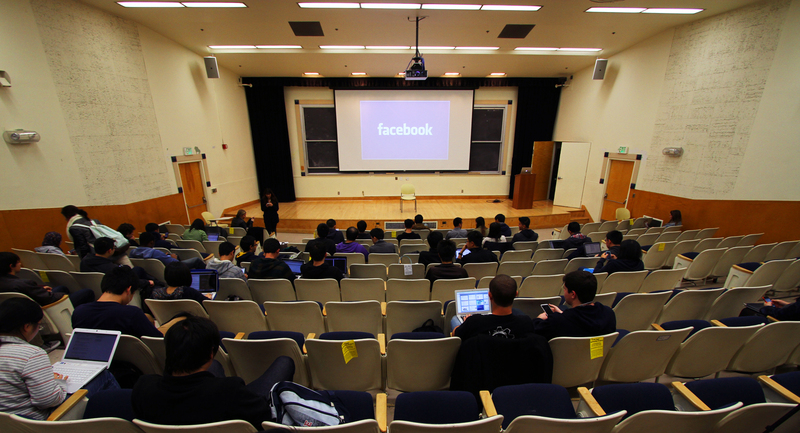 Earlier this week, I found myself at a Facebook recruitment meeting in Dwinelle Hall, filing into a lecture hall with other undergraduates gathered eagerly at the prospect of working for one of the Silicon Valley’s most lucrative companies. “It could be fun,” he said to me, smiling. I was enamored. I wandered out of the meeting imagining what I’d do with UC Berkeley’s Google glitterati. We’d discuss code (do you discuss code?) over breakfast and debate Facebook and Google Plus while marching to Pimentel Hall. Maybe, with some time, I’d even end up on a Google shuttle myself. I shot him a text soon after we met, wondering when he might be free later that week. Hours passed, but no response. He never texted me back. Recruitment meetings from tech companies, like this Facebook meeting at Dwinelle Hall, is an increasingly common sight within UC Berkeley. As quickly as James brought me into his world of high-tech gadgets, seemingly secret societies and computer science whizzes at UC Berkeley, he just as quickly and violently rejected me. My unanswered text (which was green, not blue, on my cracked iPhone screen — maybe he has an Android?) lay dormant. As an English major who uses even Google search with a hint of anxiety, this encounter brought me swiftly to terms with the foreign world of UC Berkeley computer science and the opportunities that surround it. As of late, this world is at the center of Bay Area protest, as activists speak out against Facebook, Google and other giants of the tech industry, claiming they are perpetuating growing gentrification and cultural degradation inflicted by employees living in San Francisco and shuttling to work at tech companies’ South Bay campuses. These shuttles have become the poster children of the Bay’s “tech elite” — shiny, white, gargantuan symbols of growing income inequality that have led activists to lash out against them and their riders. A group smashed a Google bus window in December. Earlier that month, protesters blocked a Google bus in San Francisco’s Mission District. Protesters even arrived at Berkeley resident and Google X developer Anthony Levandowski’s doorstep mid-January, protesting the former UC Berkeley graduate student’s involvement in developing Google Street View and the company’s self-driving car. The same day, demonstrators blocked a tech bus near the Ashby BART station. The protesters’ arguments — now long-rehearsed — go something like this: Employees carted from San Francisco to Google, Facebook, LinkedIn and other corporate campuses in the Silicon Valley are driving up rent prices and pushing longtime San Francisco natives out of their homes. Meanwhile, residents say the new software engineers on the block aren’t giving back to the community culture, spending all their time at work in the South Bay. Two recent studies out of UC Berkeley studying the impact of the tech shuttles on surrounding neighborhoods support these claims. But these protests dimmed to dead silence at the recruitment meeting, where the glamor and ease of working for Facebook took center stage. The outcry against the tech employees and the wealth they represent, which has thus far focused on current employees and the companies that support them, has left UC Berkeley’s tech community surprisingly quiet. Sophomore Trent McCormick, a computer science major, said he doesn’t often hear students from his major talking about issues of gentrification. At a campus where activists stormed a Bank of America recruitment meeting this past fall to encourage students to apply elsewhere, and the Occupy Wall Street Movement ignited campuswide engagement in fall 2011, it seems almost strange that this upwelling of protest against “tech elitism” in our own backyard hasn’t had students, or at least protesters from somewhere, marching through Qualcomm Cafe. UC Berkeley is an undisputed incubator for the Silicon Valley’s next crop of hires. Proximity and an elite computer science culture make the perfect potion for sending some of our best and brightest down the road to tech companies. Berkeley sent numerous electrical engineering and computer science, or EECS, and computer science majors to Amazon, Apple, Facebook, Google, LinkedIn, Microsoft and Twitter in 2012 and the years preceding, according to the campus’s career center. Facebook has a recruiter specifically for UC Berkeley students — a practice a company spokesperson said is common for many tech companies. And the number of UC Berkeley students focusing on tech-related majors is on the rise: 308 EECS majors graduated from UC Berkeley in 2012 — an almost 50-percent increase from the 224 EECS majors graduating in 2008. The average expected salary for engineers coming out of UC Berkeley has jumped as well — from $71,704 to $83,139 in the same time frame. (For reference, English and political science majors that same year averaged an expected salary in the $40,000 to $50,000 range). And the tech industry is taking other students as well: economics and business majors. Sherry Jiang, a senior business major who worked as an investment banking intern at Goldman Sachs last summer, just accepted a full-time position at Amazon as a business analyst. According to Jiang, more and more business students are seeking opportunities in tech. She said the program she will be joining at Amazon is only two years old. Kayleigh Barnes, a senior majoring in economics, is in the midst of interviewing for a position at DropBox. She isn’t set on tech but said that it’s a job market that has always appealed to her as a UC Berkeley student. Interns working at Google and Facebook can make about $6,500 a month — a huge leap from the unpaid internships most undergraduates are taking on. Victoria Lo, who is studying computer science and integrative biology and hunting for a tech gig this summer, said the money isn’t her reason for going into the field, but it can be for some. This money — or the prospect of it — looks different on computer science majors than your traditional get-rich-quick student stereotype. Compared with the suited-up Haas majors crowding around tables at Cafe Milano to interview for their business fraternities, or the finance hopefuls flying out to New York for interviews with financial giants like Goldman Sachs and JPMorgan Chase, computer majors look geeky, not like they’ll be making six figures and living in expensive flats in San Francisco a year out of college. Asad Soorty, a junior studying business and physics whose roommate plans to be a software engineer, said this difference can be profound. These disheveled, slightly nerdy types are the ones boarding the shuttles — the unlikely center of a growing controversy that paints techies as wealthy elitists, not as computer nerds with good intentions. Google, whose famous motto is “Don’t be evil,” currently operates about 100 buses at 80 shuttle stops throughout the Bay Area, making about 10,000 one-way trips daily, according to research published by UC Berkeley master’s students Danielle Dai and David Weinzimmer. 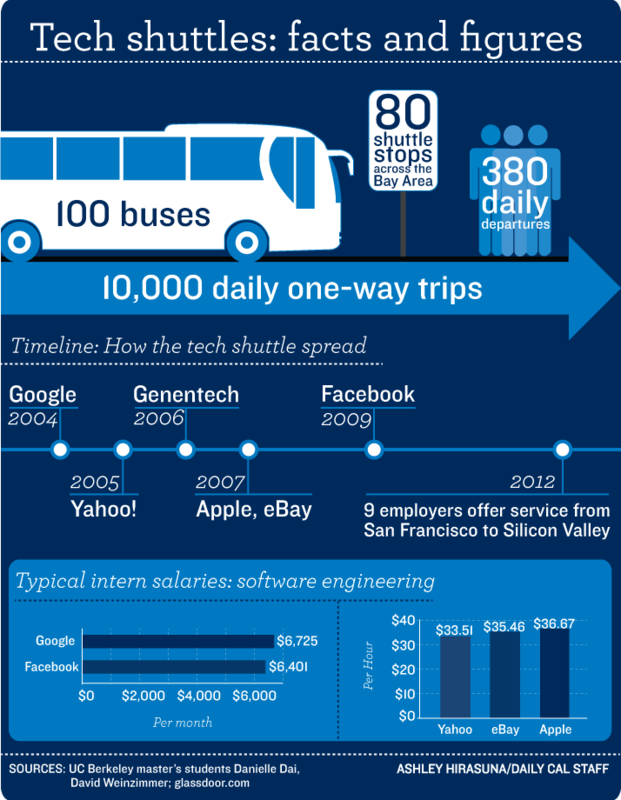 Yahoo!, Genentech, Apple, eBay, Facebook, Netflix and LinkedIn all operate shuttle services today. These buses were created to save the environment from fossil fuels and get employees working on their commute — goals that do not propose evil in and of themselves. But the “two-tiered” community that they are painting in the eyes of San Franciscans poses a real and pressing question. So maybe this is an image issue. The EECS majors navigating Sutardja Dai Hall or registering for “The Beauty and Joy of Computing” seem harmless, excited about technology and probably willing to fix your MacBook if you’re in a bind. But they also will face a question upon graduation: how and in what setting to navigate their newfound wealth and status. Innovative, fun, lucrative — it makes sense that a little shouting about gentrification takes a backseat to these exciting career prospects. Alexandra Goldman, a UC Berkeley graduate who studied the Google bus phenomenon, says the first thing students can do is be aware. Listen, and respond to texts. For James — the Google Glass-clad EECS major who scorned me — and the company he keeps, this may be a lesson that takes time to sink in.